No matter what we use the Pacifica for, safety will always be at the forefront of our minds and the Insurance Institute for Highway Safety has given it the Top Safety Pick Plus award. To qualify for a Top Safety Pick Plus rating, the vehicle must receive a good mark in the small overlap front, moderate overlap front, side, roof strength and head restraint tests along with an advanced or superior rating for front crash prevention. 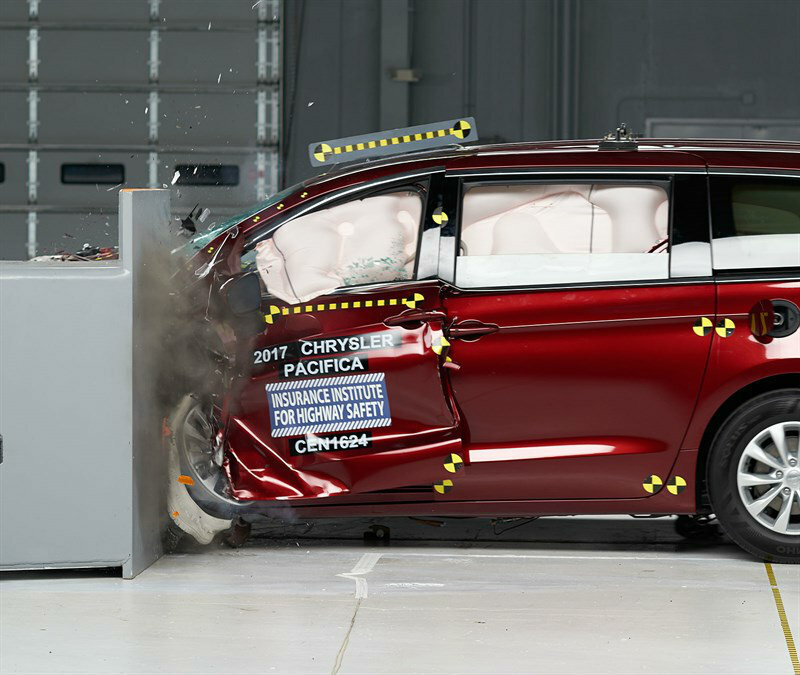 Initially, the minivan only received a 'marginal rating in the small-overlap test. This specific test was introduced in 2012 and according to The Left Lane, when the Pacifica was put to the test, its “door was torn from its hinges and came open at the front”. The Insurance Institute for Highway Safety said that a vehicle’s doors should never open in a crash because passengers can be ejected from the vehicle when this occurs. Don’t worry, Chrysler has since made adjustments to the Pacifica structure and reinforced the upper hinge and the joint. In the next test, the door remained closed and received a ‘good’ score. Below, you’ll see the small-overlap crash test in action, one of them showing a model built after August 2016 (blue) and one built before September 2016. The answer Chrysler has for Pre-September build Pacifica owners had better be more than "sorry about your luck." I don't know about anyone else, but I would consider this to be a major violation of a manufacturer acting with "due care" to protect existing and potential customers. While it is too early to talk legal remedies, to my knowledge there hasn't even been an official communication from Chrysler on the issue yet, the circumstances and timeline are certainly suspect. First with how long crash test ratings took to be published and second with how quickly (in the meanwhile) an upgraded test unit was engineered, produced, and tested again. Not to mention the fact that the production break date conveniently preceded the IIHS announcement. Mind you, all of this is going on in the background with no communication whatsoever to owners and potential buyers about a serious safety issue (evidenced by how quickly they changed the design) that could ultimately be fatal to the driver. I encourage all Pre-September build Pacifica owners to do as I have already done and contact Chrysler / FCA to communicate that doing nothing is not an acceptable answer for this issue. It is one thing to have some bugs in your UConnect infotainment system or glitches in the hands-free parking feature. Total shearing of drivers door hinges for a family car that wives (mine included) and mothers are using daily, demands a more proactive and substantial response. Obviously there are limits, they aren't going to have dealers take apart the whole front end to weld in new supports, but Chrysler / FCA employs a lot of smart engineers who figure out tough engineering problems on a daily basis. So the ball is in your court Chrysler / FCA, if as a company you care about maintaining customer goodwill (at a minimum for the ~40k Pre-September units / owners) and continuing positive buzz that the Pacifica has generated so far; act in good faith and allocate some time and resources to come up with a creative solution for people who (in the absence of 3rd party safety data) put their faith in you and your structural safety validation processes. Last edited by KW23; 09-21-2016 at 08:00 PM. Last edited by daddy-o; 09-29-2016 at 10:24 PM.